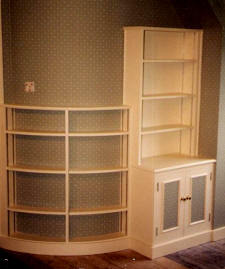 Furniture: Cupboards, Radiator Cases, Bookcases, Tables, etc. Wharf Woodcraft produce many items of quality bespoke furniture ranging from cupboards, radiator cases, bookcases and tables using only the best quality materials available. All these products can be made to your unique specifications and requirements. We can also carry out repairs to wooden items!